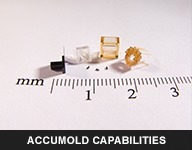 Accumold fabricates precision micro, small, and lead-free injection-molded plastic components. Using processes developed from proprietary technology, we design, build, and produce molds and parts for applications in the microelectronics and medical device markets. 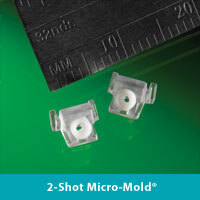 Capabilities include 2-shot, insert, and micro over molding. We also design for manufacturability, and provide tooling, mold building, automation, and packaging services. 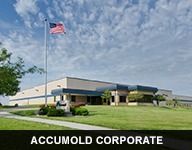 Accumold was founded in 1985. Our focus was to mold very small parts other companies could not produce. The same mission continues to drive us today. Our expertise in micro-molding and our commitment to innovation is centered on producing your critical components. This kind of work often requires micron tolerances, intricate geometries and extremely small features. Our experience and capabilities in these areas are what make us the World Leaders in Micro-Mold® Manufacturing Solutions. Today the company focuses on industries that require fast turn around and complex parts for high tech markets such as Micro-Electronics, Medical, Micro-Optics, Automotive Electronics, and Military, as well as new emerging markets and technologies. 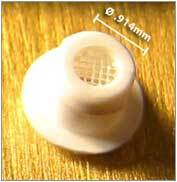 •Micro-Mold® - parts from about 13mm (0.5") and smaller. Micro-sized parts are produced in our own micro-molding machines, utilizing processes that we started our business with over 20 years ago. 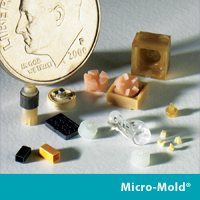 Our micro-molded parts range from about 1/2 inch in size to parts with features measured in microns. These components often have complex geometry and very tight tolerances. •Small Parts - parts up to about 90mm (3.5") in diameter or a 1 oz. shot weight. The largest part that we mold is approximately three inches in diameter, close to 1 ounce in part weight, using a 35 ton machine. Micro-sized features and ultra precision tolerances are often requirements on these "larger" parts. Using Accumold's internal modifications, with standard presses ranging from 12 ton to 35 tons, parts are made with minimal waste and fast cycle times. Because of the purity of the resin, the precision of the mold design, and the production process, Accumold can produce parts such this fiber optic connector with an integral lens. Some of the dimensions on this part are held within micron tolerances. This product was developed as result of the combined efforts of the customer's design engineers and Accumold's tool designers, saving material costs and assembly labor as compared to the traditional two piece connector and lens assembly. 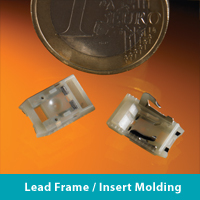 •Lead Frame / Insert Molding - parts molded around other materials such as metal, plastic, film, fabric, or glass. Manufacturing lead frame molded parts requires fabrication of a system to feed the metal lead frame into the machine and to extract the complete component from the metal after the plastic has been molded to it. Our systems designers are experts in fabricating a trouble free and efficient system to mold the most sophisticated lead frame molded parts. 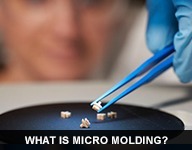 Insert micro-molding is where an existing or previously manufactured part is molded in and around a wide variety of materials from metals and glass to other plastics. The image to the left shows an example of advanced insert molding capabilities where a delicate filter was molded into a plastic housing. This required the mold to be built in such a precise fashion so that the insert material was not destroyed in the process while keeping the tolerances tight within the part itself. These parts are similar to 2-shot molding parts. - Design For Manufacturability: Our engineering team works closely with your design engineers to improve and determine manufacturability. Detailed design reviews with your team ensures expectations are met for the final piece part. - In House Tooling & Mold Building: Great tools make great parts. Being vertically integrated with tool design and build is a must in order to control this delicate process from start to finish. Cross-functional teams work to build tools that are capable of molding production ready parts. Our dedicated in-house maintenance team is also crucial to keep our production running like clockwork. 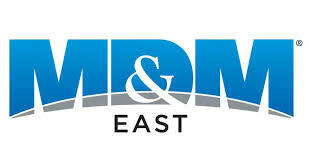 - Automation & Packaging: Molding micron sized parts is impressive, but conveying and packaging them is no small feat. Understanding fit, form and function, our team develops entire systems to protect and deliver quality parts to your specifications. Our automation team is devoted to designing and developing solutions just for you. - 24/7 Production, Tooling and Quality Inspection: Our teams of experts meet around the clock to keep up with the demand in production and tooling. Our global customers require high-quality parts, quick turn-around and constant communication no matter where they may be. At Accumold this demand has become a way of life. 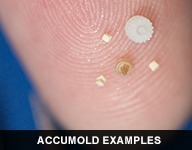 - Accumold processes highly engineered resins including PEEK, Ultem® (PEI), and LCP. - Accumold can measure surface finish and surface profiles with our in-house white-light interferometer. 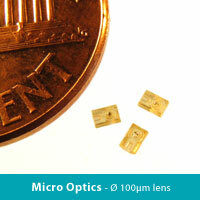 - Our state-of-the-art Quality Department uses laser and optical metrology with sub-micron accuracy. Contact us today or visit our website to learn more about how Accumold can help you on your next project.